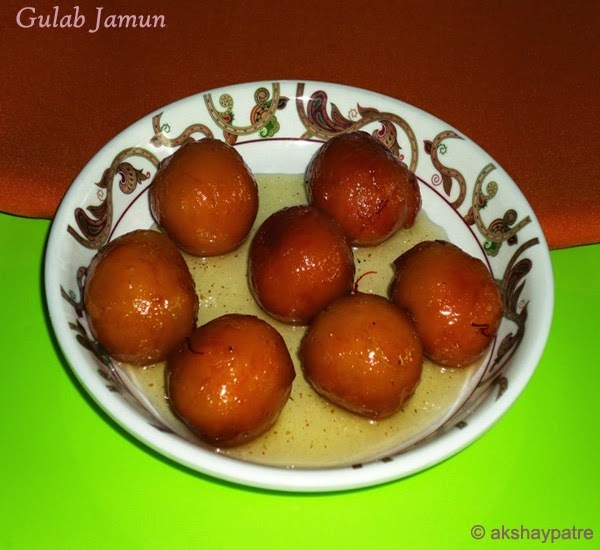 Khawa gulab jamun recipe - I love sweets prepared with khawa. 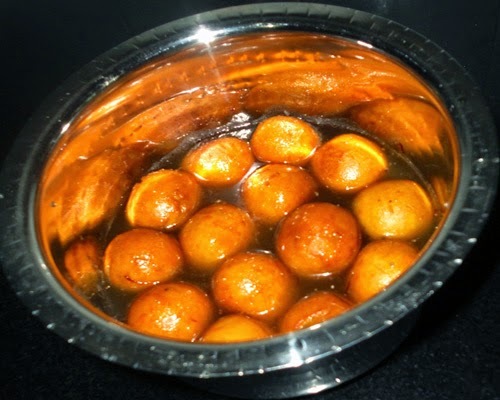 Gulab jamun prepared with mawa is tastier than gulab jamun prepared with ready made mixture available in the shop. I found gulab jamun fried in the ghee is tastier than oil fried. So I fried them in ghee to make it more tastier and flavorful. gulab jamuns should be fried on low flame, otherwise the outer part of the jamun cooks well and the inner part remains raw. The sugar syrup for gulab jamun doesn't need saffron, but I have added few saffron to make it flavourful. Making gulab jamun is very easy when one knows how to make perfect sugar syrup and the level of heat to use while frying. Put 3½ cups of sugar and 3½ cups of water in a vessel. Dissolve the sugar in the water completely. Bring it to boil and make a sticky syrup. Remove from the flame before it forms one thread. To test the correct consistency of the syrup, pour one drop of syrup on the surface and test it with your fingers. When it is touched, it should be sticky but should not form one thread. When done, remove the vessel from flame. Add few saffron strands and cardamom powder. Mix well and set aside. Take a large plate and grate the khawa in it. 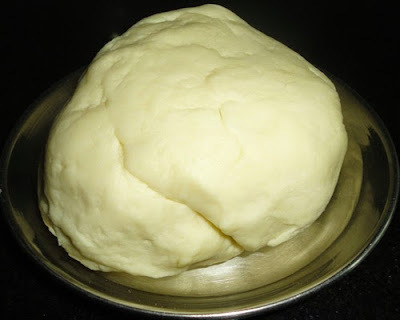 Mix the khawa, maida and baking soda in a large plate. Knead them well to make a soft dough without adding any water. Sprinkle very little milk if it is too dry. Divide the dough into 15 equal portions and shape them into round balls. Heat the ghee in a frying pan and bring it to boil. When it boils, add 4 - 5 khawa balls. Depending upon the size of your frying pan, fry the gulab jamuns in batches. 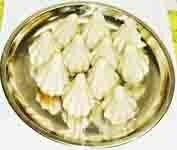 Deep fry them on low flame, rotating continuously till they turn golden colour. Note: It should be fried on low flame, otherwise the outer part of the jamun cooks well and the inner part remains raw. 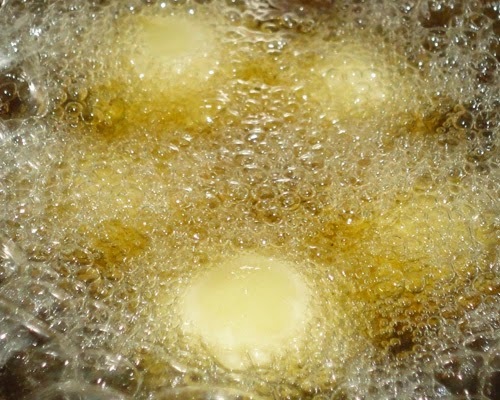 When it is done, remove the balls from the heat and put them in the sugar syrup. Serve the gulab jamun after 15-20 minutes either hot or cold. 1. Take a large plate and grate the khawa in it. 2. Mix the khawa, maida and baking soda in a large plate. 3. Knead them well to make a soft dough without adding any water. Sprinkle very little milk if it is too dry. 4. Divide the dough into 15 equal portions and shape them into round balls. 5. 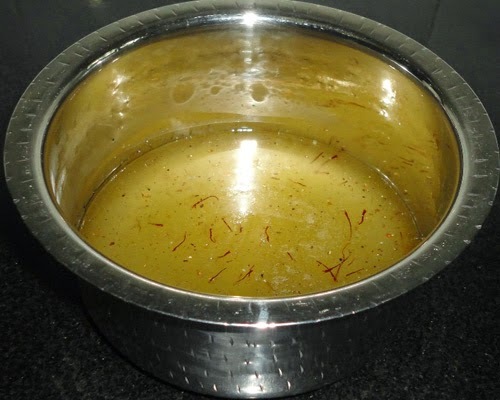 Heat the ghee in a frying pan and bring it to boil. When it boils, add 4 - 5 khawa balls. Depending upon the size of your frying pan, fry the gulab jamuns in batches. Deep fry them on low flame, rotating continuously till they turn golden colour. Note: It should be fried on low flame, otherwise the outer part of the jamun cooks well and the inner part remains raw. 6. When it is done, remove the balls from the heat and put them in the sugar syrup. 7. Serve the gulab jamun after 15-20 minutes either hot or cold. yummy juicy tempting gulab jamuns with wonderful clicks. lovely jamoons.. :) Happy to follow you! Who can say no to this cute rich luking jamuns..Awesowe prpation.